Dryunya wrote: Again, we are coming back to my model. Mine has a completely opposite problem: its universes do not intersect. I made each layer of the fictional world divided by franchises (that's probably not the correct word to use here, but whatever). I think that bit needs to be changed, but I have no idea how. okay so people create the fictional worlds by making the stories right? So imagine our level of reality has tiny strings that attach them to our world. Those strings go through a wall so that that opens one way, allowing us to change fiction but not vice versa. Now if there are cracks in said wall the characters can ride the connection back into our world through said cracks. Actually, Dryu, your model isn't complex enough. I know someone said to try and get this into the range that human minds can comprehend, but I'm probably about to do the opposite, so sorry mate. The issue is my mind works in weird ways normally and right now I'm hyped up on caffeine. Basically, Dryu's franchise separation scheme is more or less correct. Every story in our world that isn't connected to another one has it's own 'universe' (and sometimes multiverse. I'm looking at you, Nasuverse.) All of these 'verses are on the other side of the fourth wall in a kind of superverse. 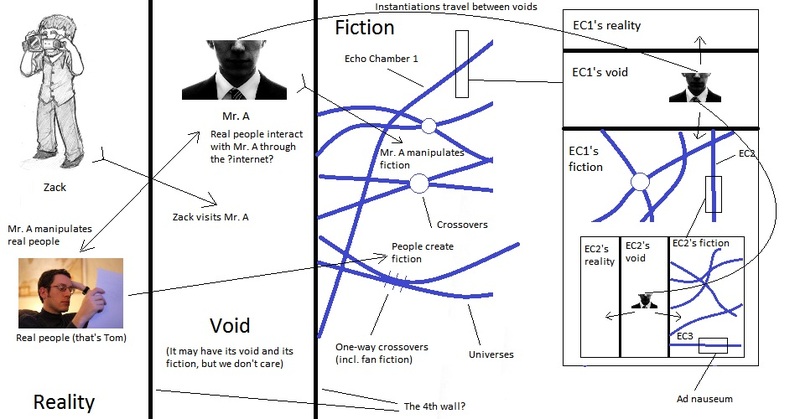 However, each time one of the sub universes includes other universes as fiction, you have a fourth wall that travels horizontally across the layer, as opposed to the walls that go down to a deeper layer. All shows within shows create yet another layer, subdivided and interconnected just like the first, ad infinitum. Also, on the topic of whether or not we are the highest level, I suggest working with the assumption that we are. If we aren't there is nothing we can do about it right now, and if Mr. A is manipulating this world as well from somewhere higher up, again, nothing we can do. Basically, worrying at this stage is pointless, since we have better stuff to do. Now I'm going to work on that semaphore puzzle if you haven't already finished. Also, on the topic of whether or not we are the highest level, I suggest working with the assumption that we are. If we aren't there is nothing we can do about it right now, and if Mr. A is manipulating this world as well from somewhere higher up, again, nothing we can do. Basically, worrying at this stage is pointless, since we have better stuff to do. Agreed, at this point I hardly think it matters whether we are or not anyway. We need to operate on the assumption that everything begins on our level, and the void. I mean, if there's anything happening on a hypothetical layer ABOVE us then that would kind of render all our efforts null and void, wouldn't it? Because we'd be at the mercy of that above layer. Scarab wrote: Agreed, at this point I hardly think it matters whether we are or not anyway. We need to operate on the assumption that everything begins on our level, and the void. I mean, if there's anything happening on a hypothetical layer ABOVE us then that would kind of render all our efforts null and void, wouldn't it? Because we'd be at the mercy of that above layer. What would it matter to us if there was a level above us? How would it destroy our efforts? If there is, then we are being controlled to make said efforts, true, but I have made all of my decisions thus far based on my own logic and whims. I can trace that logic back through cause and effect (theoretically) through all of time, so it makes no difference to me whether there is a layer above us because it will change absolutely nothing. Cause and effect will move onwards, I will make the decisions that I will make regardless, and the same can be said of all of you as well. If another layer doesn't matter then the same can be said for fictional characters. NeverSlender wrote: If another layer doesn't matter then the same can be said for fictional characters. Normally you would be right. Normally. But normally Poirot and the Cat wouldn't be mucking about on the internet. Basically, the fact that your statement isn't right is the whole issue at stake here. Last edited by Sicon112 on Mon Oct 01, 2012 9:11 pm, edited 1 time in total. Mm, I thought it was the very nature of the problem - that they're entering Our Layer/Reality, a layer they were never supposed to be and ergo, stepping outside of the control of their creators? Maybe something DIRECTED them to escape in the first place: be it a threat on their side of the wall, or maybe even an instruction placeds by a Reality-based writer. Sorry, am I just making silly assumptions based on a lack of caffiene? I really need to go get more caffiene. Scarab wrote: Sorry, am I just making silly assumptions based on a lack of caffiene? I really need to go get more caffiene. Also, this thread is, for the most part, to construct the model itself. We are not going to go into the why as of yet. (For reasons, see last few posts in the "Monster on the other side" thread. I don't think you understand what I mean. I meant that if there was another layer for us but we can trace our actions through logic, cause and effect, so could fictional characters. They think they make their own decisions. You're right I didn't understand what you meant. Sorry about that, I think I get it now. Edit: because you were talking to the person above me, not me (again, sorry!) but I apparantly didn't understand anyway, so the apology still counts. NeverSlender wrote: I don't think you understand what I mean. I meant that if there was another layer for us but we can trace our actions through logic, cause and effect, so could fictional characters. They think they make their own decisions. I am aware of that. And, according to this model, as far as their layer is concerned, they do. And From a Certain Point of View, that is actually correct. When they are created, their very universe and all it's history is created at the same time. As far as their layer is concerned, all of that actually happens, though we do not see it, and when they are created, they have 'character'. When people are written by a different author (With the exception of fanfiction, which I'm not sure actually directly manifests itself under this model. At least in most cases) they create a parallel version of themselves most times because their characters are slightly different. Therefore, each permutation always acts in character, and by acting in character, takes the choices in their story that they would take as a person regardless. I admire both your caffiene tolerance, because I can imagine an awful lot of it was consumed, and your thought processes. Scarab wrote: I admire both your caffiene tolerance, because I can imagine an awful lot of it was consumed, and your thought processes. To me, it makes perfect sense, which may very well be exactly what you were afraid of, but whatever. Basically, the metaverse model has long ago outgrown, detail wise, what it really needs to be and entered the realm of just for fun. I sort of keep it growing in complexity every time I get a new thought about it like some sort of evil weed. Sorry. Even though you are more or less correct, all we need to know (I hope) to apply the metaverse model is that fiction and our reality are separated by the fourth wall, inside/above/to-the-left-of/all-of-the-previous-at-once-which-I-assure-you-makes-sense-in-some-dimension-incomprehsible-to-the-human-mind of which is the void, where Mr. A is, and this pattern branches out downwards ostensibly for eternity. Fiction should be unaware of the reality/ies above it, but somehow the fourth wall has been cracked and the fictional characters from below are jumping into our world. ... in fact, now that I consider it, this metaverse model has all been just for fun in the first place. You know what would be hilarious though? If I had actually (somehow) been right about how the Echo Chamber/Wall verse worked and those in the know freaked out. Last edited by Sicon112 on Mon Oct 01, 2012 7:44 pm, edited 1 time in total. Maybe it's not a stack model, as Dryuna suggested, but a circle model, where everything is at the same distance (not being more or less) from the center, that is, the void. But, that assuming reality=fiction. Maybe Reality is the center of everything, with a wall of void and a sphere of fiction around. An infinte number of tangents can be drawn from a circle. Infinite layers? it's more like reality is the TOP of everything. making it a circle doesn't make all that much sense. It kinda loses the idea of the Show Within A Show concept displayed by Echo Chamber. Hey, that works for me, my brain was kind of about to explode anyway. It's like kudzu, the way things just keep growing.I think we probably understand as much as we really need to. Hilarious, with a side order of awesome. 1. The relations between franchises are not really important, as they distract us from the problem at hand, just like the Void's fiction. 2. We need to incorporate Zack into the model. 3. Just a thought. The Void's existence may begin later that the Wall's. What I'm hinting at is, you know, TV Tropes. What we know about Mr. A is that he is dedicated to studying relations between fiction and reality, and that somewhat resembles what TV Tropes do. Also, TV Tropes are at the root of this ARG, after all. 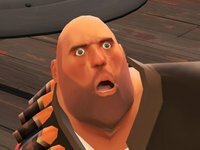 3.5: The Void may be a place where the metastuff happens. Needless to say, metafiction appeared later than fiction per se. 4. I am obsessed with numbered lists. UPD: Here is version 2. It includes crossovers between universes, as well as the interactions between entities. 1. Where exactly is the 4th wall in this model? 3. How do the real people actually interact with Mr. A? Tom seemed to talk to him through an actual screen, but Mr. A can summon those between-the-fingers screens. It may be a portal, or something. UPD: I've rewatched the penultimate episode - Mark speaks to Mr. A through a picture, but it may just be a fancy LCD frame. Dryunya wrote: 3. Just a thought. The Void's existence may begin later that the Wall's. What I'm hinting at is, you know, TV Tropes. What we know about Mr. A is that he is dedicated to studying relations between fiction and reality, and that somewhat resembles what TV Tropes do. Also, TV Tropes are at the root of this ARG, after all. I have thought for a while that Mr. Administrator might be the incarnation of TVTropes itself. I believe that was mentioned on the WMG page. I'll say it again - I read some Word Of God (sorry, don't remember the source) somewhere around the end of season 1 that said some of the WMGs were frighteningly close. Of course, it didn't say which ones. Dryunya wrote: I believe that was mentioned on the WMG page. I'll say it again - I read some Word Of God (sorry, don't remember the source) somewhere around the end of season 1 that said some of the WMGs were frighteningly close. Of course, it didn't say which ones. You know what... What the hell. I'll just rule out all clearly impossible and joking, and see what remains. I invite you to the "unnamed man" thread for that. I'm sorry that this completely destroys everything you've mentioned, but I felt the need to put my thoughts forward. I've always imagined the multiverse as a ridiculously huge section of space, with each fandom/franchise/fictite world being a "galaxy" in the section. Flames of Chaos, Flames of Order. Doesn't matter, I have to run from Slendy.